At Kosenji Temple in Kusatsu Onsen town (Gunma Prefecture), there is mysteriously placed among the other bodhisattva steles, dosojin statues, etc. 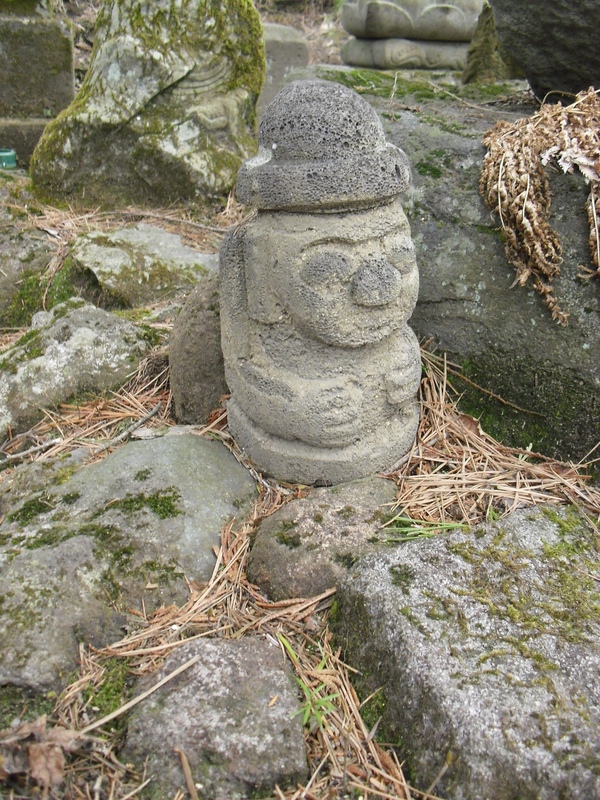 a very small statue that is almost identical to the dol hareubang or stone grandfather guardians of Cheju Island of South Korea. Whether this was a donation of a passing migrant from the area of Cheju Island, or that Kosenji Temple was established by Korean migrants, the idea of the connection is tantalizing. A Cheju Island Korean connection? Dol Hareubang in Korean means “stone grandfather”. Cheju Island is Korea’s most important fishery and the Ama diver women of Northern Kyushu are reportedly said to have migrated from Cheju Island in ancient times. Still it is a mystery how this statue came to be found in this part of Japan (none reported anywhere else for that matter). Cheju Island’s dol hareubang are said to have arrived from the north with shamanic mushroom culture and magic mushroom cult. 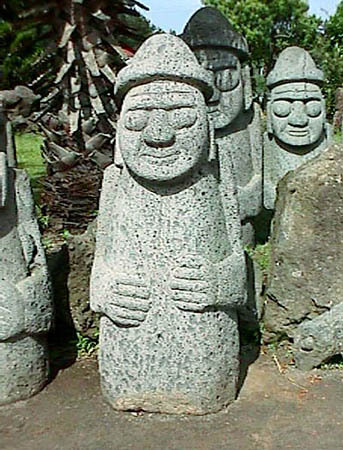 The stone guardians according to tradition are believed to provide people with both protection and fertility. In the past, the statues were placed outside of gates for protection against demons traveling between realities. Small replicas are sometimes given to women with fertility problems. There are fire festivals on Cheju Island for keeping away insects that are identical fire festivals in Japan, such as those practised on Izu Peninsula for instance. Scholars have noted the mythic connection of the Ama people, especially the Mie ama, to Amaterasu, who consider themselves to be descended from the sun goddessthat is the official ancestress of the Imperial family. It may be that the acquisition of the statue may be a relatively recent one rather than a prehistoric one. Janet Hunter in “Japanese Women Working” notes “solid evidence that at least some divers migrated from Cheju Island in Korea”, but that the origin of the Ama village-Ise-imperial family connection may have been no more than the initial promise by the ama ancestress of Kuzaki village (Toba city, Mie) that its Ama kanbe or guild’s (and descendents) would always procure abalone for the Ise Shrine for its offerings to the deities. The small figure looks relatively new to me compared to older stone figures in Japan. Maybe even maybe modern. The similarity is tantalizing, though!